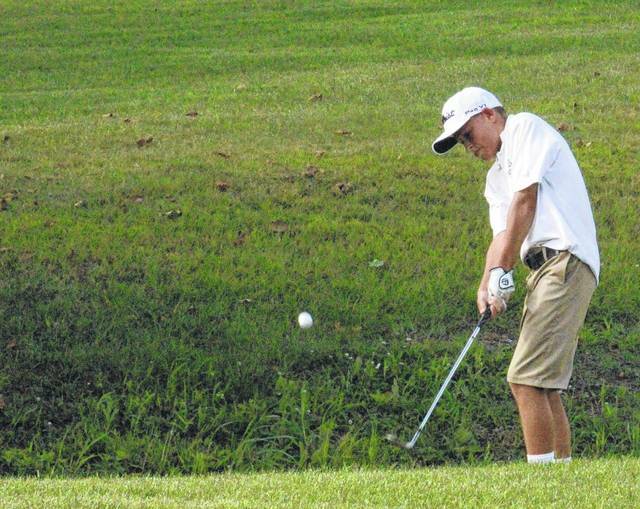 GALLIPOLIS, Ohio — Golf in Gallia County was on full display on a hot and humid Thursday, as the Gallia Academy Blue Devils played host to the River Valley Raiders and South Gallia Rebels. The Blue Devils divided up into two boys teams with five golfers apiece, as the Gallia Academy “White” club fired a team total of 172 to take the match —held at Cliffside Golf Club in Gallipolis. South Gallia, which also fielded five players, was second with a 235 —while River Valley and Gallia Academy “Blue” both totaled a 239. There were only four players for River Valley, as the top four scores of five counted towards the team total. The Gallia Academy Blue Angels also competed on Thursday, splitting into two teams and taking on the two-person Lady Rebels. The Blue Angels “B” squad, consisting of five ladies, edged out the four-person “A” team by six shots —221-227. The South Gallia girls had just two players —Madisyan Spurlock (73) and Gabby Spurlock (74). The entire field took aim at the par-36 Cliffside back side, and Gallia Academy sole senior Kaden Thomas —playing with the “White” team — fired a one-over-par 37 to claim match medalist honors. His “White” teammate —Wyatt Sipple —posted a 43, while the other two counting scores were a 46 apiece by Reece Thomas and Cooper Davis. Grant Bryan was the non-counting score with a 53. For the Rebels, senior Curtis Haner had a 50, while the other counting cards were Layne Ours with a 60, Noah Spurlock with a 61 and Dustin Bainter with a 64. The Blue Devils’ “Blue” unit included three scores in the 50s —by Hobie Graham (54), Elijah Baird (56) and Nick Mayes (58) — while Bo Saxon shot a 71 for the final counting score. Elijah Blazer of the “Blue” group was disqualified. River Valley was paced by medalist runner-up Aaron Burke with a 42, while Elayna Canizares shot 60, Gabe Gilmore 67 and Tyler Roberts 70. For the girls side, sophomore Bailey Meadows mustered a 49 for the match medalist, as she led the “B” team along with Hunter Copley with a 51. That fivesome’s other two counting cards were a 54 by Avery Minton and a 67 from Abby Fitzwater. Molly Fitzwater finished with a 51 to lead the “A” team, as its other three scores were a 53 by Macy Jones, a 57 by Ryelee Sipple and a 66 by Lilly Rees. Gallia Academy freshman Grant Bryan chips to the 11th green during Thursday’s golf match at Cliffside Golf Club in Gallipolis. 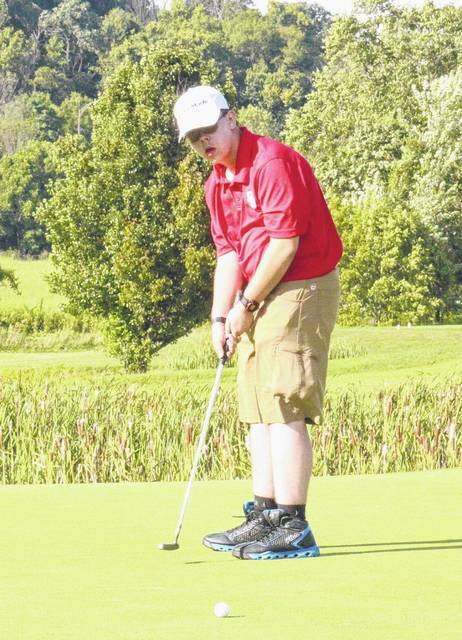 South Gallia’s Noah Spurlock putts on the 15th hole during Thursday’s golf match at Cliffside Golf Club in Gallipolis.